The rap star, who calls Atlanta home, will be running with Mayor Keisha Lance Bottoms to raise $1 million for youth via his Street Dreamz Foundation, the Mayor’s Youth Scholarship Program and Atlanta Track Club’s Kilometer Kids program. It will be his first 10K race. 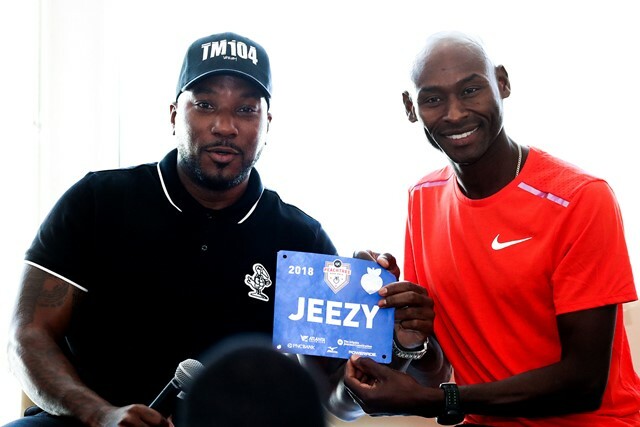 Two-time Olympic medalist Bernard Lagat, among the athletes here to compete in the USA 10 km Championships, was glad to oblige, joining Jeezy on stage to offer some pointers. But Peachtree can also be joyous, even to the athletes with a first prize of $10,000 at stake. “I have been a citizen for a little over two years, and my second Fourth of July was here last year, and it was really emotional I won a few U.S. championships, but this was a little different. At the finish line I teared up a bit, because there were so many more people crossing that line,” she said, of the 60,000 runners behind her. In what Tuliamuk herself called one of the strongest fields she has run in lately, her challengers will include Sarah Pagano, who has finished second the past two years in the 10 km championships; Sara Hall, who finished second here in 2014; and Gwen Jorgensen, the 2016 Olympic triathlon gold medalist-turned-2020 marathon hopeful who is making her U.S. 10K road debut here. “I’m excited to go out there and just put myself in the race, hopefully,” said Jorgensen, whose 10K personal best is second only to Tuliamuk’s in the field. On the men’s side, two-time Olympian Lopez Lomong, fresh off his surprise 10,000-meter victory at the USATF Outdoor Nationals on the track, will be making his 10K road debut against a veteran lineup that includes Lagat; last year’s third-place finisher, Sam Chelanga; Tyler Pennel, who has twice been runner-up here; and reigning USA Half Marathon champion Chris Derrick. Last year, Derrick kicked past Lagat, now 43, to finish fourth here. Neither has forgotten. “I remember clearly that last stretch and Chris Derrick really had no mercy on me,” said Lagat. “I wanted it way more than he did last year,” Derrick explained wryly. “He was like “I’m a five-time Olympian, this is for fourth place, it’s fine,’ and I was like ‘He’s 42 years old … it’s my turn. I tore a piece of my soul out to beat him last year.